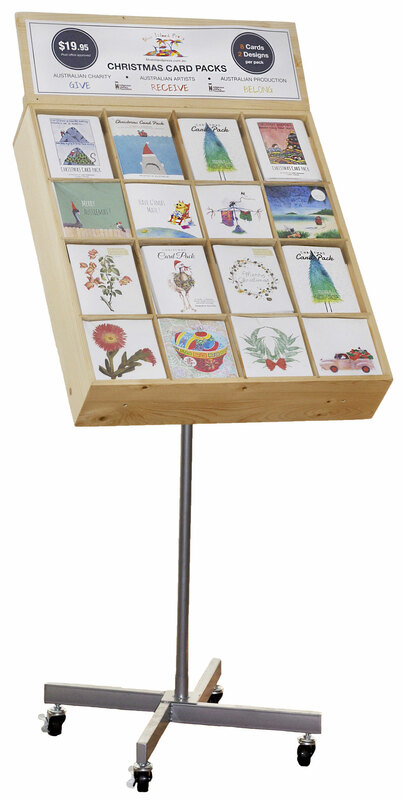 The card stand has a 45 cm foot print and comes on wheels. It is made of solid timber with perspex shelves and metal corner pockets. The stand holds 84 large cards, 18 gift cards, and 16 slim cards. The 16 Pack Display Box holds 96 packs, 8 rectangle and 8 square card packs, 6 of each design. The footprint is minimal, only 60 x 35 cm and 130 cm high. The Display Boxes are made with sustainable timber and steel plus wheels for easy movement including brakes to avoid runaway situations. The Calendar Stand is 33 cm wide and 180 cm high and comes on wheels. It is 3-sided and holds 12 calendar designs, 4 of each. The 32 Pack Display Box holds 192 packs, 16 rectangle and 16 square card packs, 6 of each design. The footprint is minimal, only 60 x 35 cm and 130 cm high. The Display Boxes are made with sustainable timber and steel plus wheels for easy movement including brakes to avoid runaway situations. Stands are free on loan and must be used for Blue Island Press product. A small freight cost comes with each stand. Click Here to download a pdf file containing information on the display stands.